Rothschild's giraffe at Lake Nakuru, Great Rift Valley, Kenya. A community project at Kenya's Lake Baringo is attempting to save the subspecies. 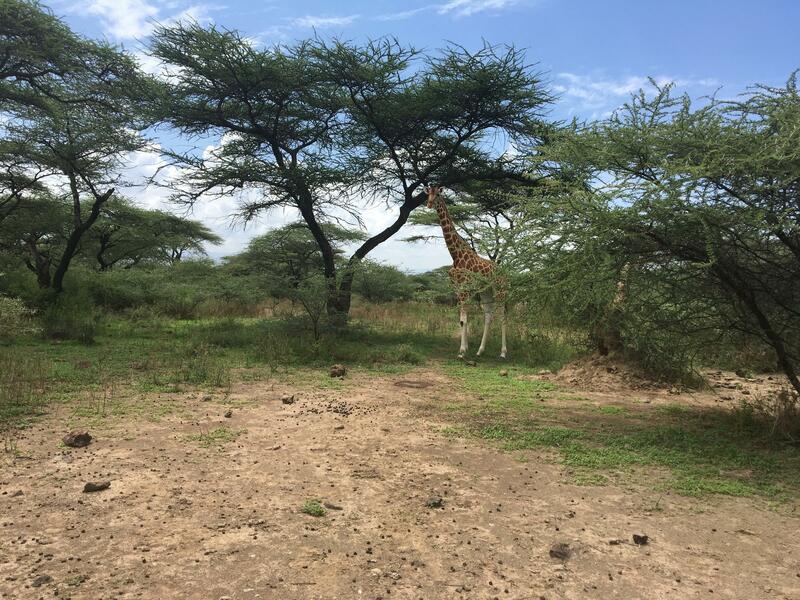 Lake Baringo, an ancient volcanic formation, is now the home to a conservation effort trying to reintroduce the Rothschild's giraffe to the area. They were poached to disappearance in this area about 60 years ago. One of the six giraffes at the Ruko Conservancy in Kenya's Lake Baringo area. In 2012, conservationists decided to bring the subspecies back. They trucked eight giraffes from conservancies in other parts of Kenya and then put them on barges to be disembarked on an island in the middle of Lake Baringo. It's part of the 40,000-acre Ruko Conservancy, a community-run program that brought the giraffes back home. As Kochulem steps out of the small boat, she says that for a long time, everyone sort of assumed that giraffes as whole were OK. But a survey in 2016 found that nearly 40 percent of the population across the continent had been wiped out in one generation. With fewer than 97,562 of all nine subspecies left, the International Union for Conservation of Nature (IUCN) listed them as "vulnerable" on its threatened species index. The world was waiting for a tragedy before taking action, says Kochulem. "So maybe it was too late somehow, but I think that now with the protection that is happening we are thinking that it might save them," she says. Kochulem walks down a steep, rocky hill. She grows quiet as she weaves through the acacia trees and suddenly, as she walks onto a plain, a giraffe comes into view. It's so tall, its movements are a little like lighting and thunder — what happens in its legs takes seconds to echo through its neck and finally its head. You can tell it's a Rothschild's because its pattern tapers toward the bottom of its legs, making it look like it's wearing white socks. There are only six giraffes left at the conservancy. Two of the originals have died and the conservancy has lost three calves. One of them was strangled by a python, the others they think died of bad nutrition or pneumonia. Kochulem says what they've learned here is that giraffes are difficult to care for. It took six years for these giraffes to start reproducing. Two of them are pregnant, and the hope is that the community has learned enough six years into this experiment to keep the calves alive. The Giraffe Center in Nairobi is one of the oldest giraffe conservation organizations in the world. 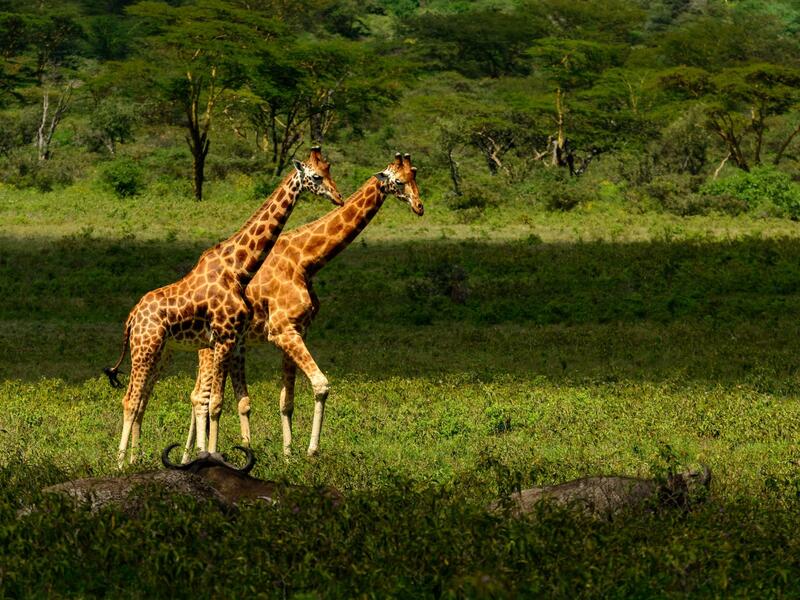 When it was founded in 1979, there were only 150 Rothschild's giraffes left in Kenya. Stanley Kosgey, in charge of conservation education at the center, says the tallest animals in the world have never really gotten the same attention from conservationists and governments that other African mammals have. In some ways, he thinks, it's because they're hard to miss. In Kenya, it's not rare to see half a dozen of them as you drive past some field on the highway. It can take you several safaris before you catch glimpse of a lion. "Giraffes are in what I would call a silent extinction," Kosgey says. In a lot of ways, he says, a perfect storm has befallen the species. Climate change means longer droughts and new diseases; civil unrest means giraffes become easy food; and as African countries grow, humans have encroached on wildlife areas and deforestation becomes a huge issue. Giraffes are huge creatures, and they require a lot of space and vegetation. Kosgey says the good news is that the world has begun to pay attention. In Kenya, which has some of the best conservation policies on the continent, there is a plan underway to treat giraffes in the same way that lions, rhinos and elephants are treated. That's to put in place elaborate action plans and programs to make sure those animals thrive. The first step for giraffes is to get a deeper understanding of their population by conducting a comprehensive census. Kosgey says their conservation effort alone has saved the Rothschild's giraffe. There are now about 650 of them in Kenya. Worldwide, there are 1,671 Rothschild's, about 26 percent more than there were in the 1960s, according to the IUCN. "They are tall, graceful animals and they should be heard," Kosgey says. One day, the giraffes on Lake Baringo will be moved to the mainland. But for decades, this area of Kenya has been a battleground for two tribes: the Pokots and the Njemps. It will be a challenge to find peaceful areas where giraffes can roam. But tribe members say the animal has ultimately served as a peacemaker. Kochulem takes a small boat from the giraffe island, out of the conservancy to Ol Kokwe Island. It's one of the bigger islands on the lake with hills dotted by small thatched huts. As she walks on shore, Kochulem is welcomed by two Njemp tribe elders, Mzee Lebene and Lowombe. "The conservancy has helped to forge peace," Lowombe says. Ruko is run by a board made up of members from the two tribes. The communities have to make decisions together. The rangers come from both tribes, so it creates empathy and understanding, he says. Back in 2005, the Pokots invaded Njemp territory on the mainland. A lot of people were violently displaced and they settled with family members on Ol Kokwe Island. Right now the conservancy is discussing two big things: the move of the giraffes to the mainland and a plan to return the Njemp people to the land conquered by the Pokots. "We take hope from the giraffes, that one day we will all go home and learn to live together," Mzee Lebene says. Kochulem, a Pokot, says this is the hard part. The talks, she says, have been productive but the conflict runs deep. One thing she knows for sure, she says, is if humans can't find peace, neither will the animals. Ninety-eight thousand - that's how many giraffes are left roaming Africa. It reflects a drop of 40 percent in the past three decades. Experts call this a silent extinction. The issue is the latest in our series Take A Number examining problems around the world through the lens of a single number. NPR's Eyder Peralta reports on a conservancy in Kenya bringing giraffes back home. EYDER PERALTA, BYLINE: From the boat, Rebecca Kochulem points at the hills surrounding the lake. They're lush, green with acacia trees. REBECCA KOCHULEM: It's good ecology. It's good habitat, except only problem is that most of the species were wiped out from this area because of poaching. PERALTA: Kochulem and I are headed toward an island in the middle of Lake Baringo in search of giraffes. We ride past gurgling hot springs, past other islands with towering red cliffs that plunge into the water. Many decades ago, this was home to the Rothchild (ph) giraffe, but hunters killed them all. KOCHULEM: If you asked an elder, maybe those of 60 years plus, they will tell you we used to hunt them. KOCHULEM: It's maybe 60 years plus. PERALTA: The boat stops. Kochulem guides me onto the island. Hi, how are you? I'm Eyder. It's part of the Ruko Conservancy, a small community-run program that brought giraffes back home. Kochulem, a zoologist who manages this program, says everyone sort of assumed that giraffes were OK. But a survey in 2016 found that nearly 40 percent of the population had been wiped out in one generation. The world, says Kochulem, was waiting for a tragedy before taking action. KOCHULEM: So maybe it was, like, too late somehow. But I think with now the protection that is happening, we're thinking that it might save them. PERALTA: In 2012, this conservancy literally shipped in eight giraffes. Two of them have died, and the conservancy has lost three calves. One of them was strangled by a python. The others they think died of bad nutrition or pneumonia. We walk down a steep, rocky hill and onto a plain. Between the acacia trees, a giraffe comes into view. It's so tall what happens in the legs takes seconds to echo through its neck and finally its head. KOCHULEM: She's the one who - she's due in May. PERALTA: So she's the pregnant one. KOCHULEM: And the other one is in June. PERALTA: So this is going to be a big test for you. KOCHULEM: Yeah, for us. That's why we are really planning to ensure that we have them safe during that time and after. PERALTA: And I guess what you all have learned here is that keeping giraffes is not easy. KOCHULEM: It's not easy. It's not easy. PERALTA: The Rothchild subspecies of giraffe almost disappeared. In the 1970s, they were down to 150 in Kenya, mostly because of humans. Rebecca Kochulem takes me from the giraffe island to Ol Kokwe Island. For decades, this part of Kenya has been a battleground for two tribes - the Pokots and the Njemps. This conservancy is actually run by a board made of members from the two tribes. Two elders, Mzee Lebene and Lowombe, welcome us. PERALTA: Lowombe says the conservancy has helped to forge peace. The communities have to make decisions together. The rangers come from both communities. So it creates empathy and understanding. Back in 2005, the Pokots invaded Njemp territory. A lot of people here were violently displaced to this island. And two things the Ruko Conservancy board has to discuss is a plan to move the giraffes from the safety of the island to the mainland and a plan to return the Njemps to conquered land. MZEE LEBENE: (Foreign language spoken). PERALTA: Mzee Lebene says they take hope from the giraffes that one day they will all go home and learn to live together. Back on the water, I ask Kochulem if she's surprised at how much work with humans it takes to save giraffes. No, she says, because if humans can't find peace, neither will the animals. 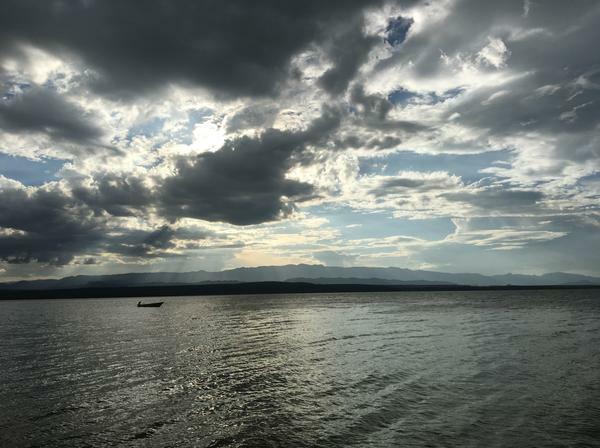 Eyder Peralta, NPR News, on Lake Baringo in Kenya. Transcript provided by NPR, Copyright NPR.